At Speed Scene Wiring, we physically handcraft only the finest LS1, LS3, LSX harness systems, that money can buy. Our custom wiring harnesses are built in USA, with new TXL and GXL synthetic low resistance color coded wire. A good mechanical crimp, with the correct tooling to all terminals, is our standard, then soldering all terminations. This undoubtedly seals the deal, and the end result, uncompromising quality – second to none. We also preform wire harness modifications & repairs. Depending on the integrity and year of the LS1 or LT1 wire harness, this can save time and money. Requirements: Send in the factory General Motors, Ford, Duramax harness and Delphi/ACDelco computer, we will re-wire and re-program, then send it back. We also modify the following wiring and injection systems. LS conversion wiring harnesses are awesome. 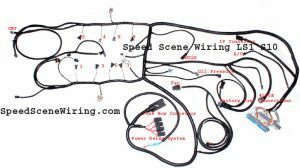 If you have a stock TBI fuel injected truck, with a Vortec 4.3L and want to change the engine to a LM7 or LS1 power-plant, Speed Scene Wiring will marry the two harnesses together to make one. This is the only way we recommend, due to the fact that if the harness is not converted properly, the dash/ four wheel drive, ABS and on board computer will not function, at all. This is the most time consuming part of any new power plant install, making the dash and computers work in harmony, at the speed of light. GM Computer programming is just as important as wiring, this is what runs the engine. We spend countless hours, matching up the correct calibration, for your specific application. If you are in need of only the ECM tuning, let us know, we will help out any way we can. Computers required to properly run your engine wiring are, engine ECM, pedal, TAC module, transmission controller. With systems such as the LS3 and the LS9, the computer and transmission controller are integrated. One must follow exact program and connection sequence for ultimate performance. The LS3 and LS7 controller program has to be a blue-printed, to all system controllers, for you to have 100% success and great drive-ability. Ending note : We simplify the entire process and make buying a new LS fuel injection wire harness, to run your GM power plant; very easy. You literally have too many options – in our current market. From cheap knock-off imitations, to mass produced systems; that just dont work. We can help you narrow it down. If you have question about the LS power-plant you are about to install or wire harness that you want to invest in, contact ssw, we stand behind what we sell, since 1999.